The Embassy of India, Kathmandu is pleased to announce a special tailor-made training course on ‘Global Perspectives on Public Financial Management’ for 62 officials of the Ministry of Finance (MOF) of the Government of Nepal under Indian Technical and Economic Cooperation (ITEC) programme of the Government of India. Earlier, Ministry of Finance, Govt. of Nepal had requested to the Government of India for providing such training course to these officials under Nepal-India Economic Co-operation Programme. The programme is designed as per the requirement of the Ministry of Finance of Nepal and is being held at the Institute of Government Accounts and Finance (INGAF). The training will enhance the capabilities of these officials in global practices dealing with e-payment system, accounting & cash management, public burrowing system, accounting of foreign loans/grants and repayments, pension payment system, internal audit, fiscal responsibility and budget management, etc. The training course will be held in three batches. 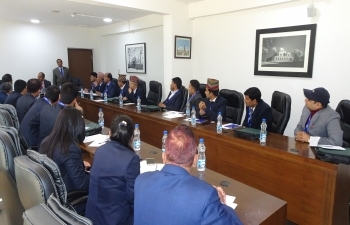 The first batch of 20 Nepali officials is currently undergoing training at INGAF, New Delhi from January 14, 2019. The INGAF, New Delhi is a premier training institute of Government of India in the field of Public Financial Management with state-of-the-art learning facilities. INGAF’s recognition across the spectrum has led to having associations and collaborations with premier institutions like Institute of Internal Auditors (IIA) Florida, Atlanta School of Public Policy, Duke University, Management Development Institute (MDI) Gurgaon, Indian Institute of Management, Bengaluru, etc. The INGAF, New Delhi is Partner Institute for imparting trainings of officials from friendly developing countries under the Indian Technical and Economic Cooperation (ITEC) programme of the Government of India. In addition to some of their global programmes, the INGAF, New Delhi has been undertaking tailor-made trainings for officials from the neighbouring countries like Afghanistan, Bangladesh, Bhutan, Maldives, and Sri Lanka.